The compact yet robust AR-6023NV , A3 Monochrome 23 PPM printer offers sophisticated features to match the changing productivity needs of small workgroups. Whether it’s a copy, print, or scan job, document functionality comes with consistently excellent quality. Everyone on your team will appreciate a streamlined workflow and boosted productivity. With one of these affordable MFPs, you have a versatile all-in-one document solution. Sharpdesk Mobile is a mobile print/scan application. With Sharpdesk Mobile, users can import documents scanned on the AR-6023NV to their mobile devices for previewing and saving. And files on a mobile device can be printed out on the MFP, sent as e-mail attachments, or used in other applications. The AR-6023NV excels as a full-colour network scanner. Quickly convert any type of paper-based document into a TIFF, PDF, or JPEG and send it to one of six pre-registered destinations. Scanned files can be sent as e-mail attachments, sent directly to a PC desktop, or scanned directly to an FTP server, and USB drive It’s all so easy—just tap the Scan Mode button, select a pre-registered destination, and press Start. An optional RSPF (reversing single pass feeder) efficiently feeds in up to 100 sheets of either one- or two-sided originals. The AR-6023NV can make two-sided printouts using its built-in stackless duplex module. 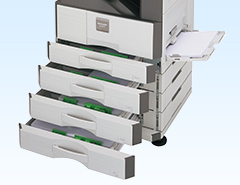 This effectively reduces paper costs and saves filing space. Duplex copying is even more effective when used together with the optional RSPF. For large-volume jobs and a wider selection of available paper sizes, these MFPs can accommodate two types of extra trays that increase total paper capacity to 1,850 sheets AR-6023NV. This advanced MFP can accommodate heavy paper up to 200 g/m2*, expanding the range of possible printing applications. *106–200 g/m2 paper to be fed through multi-bypass tray. AR-6023NV is equipped with a Standard 64MB memory in addition to the 256 MB Memory embedded in the printer board. It’s also supported with an Optional 128MB Expansion board to address memory intensive workflows and requirements.